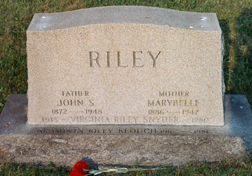 Marybelle (Minerd) Riley was born on Dec. 9, 1886 in Dunbar, Fayette County, PA, the daughter of Rev. David E. and Catherine (Williams) Minerd. She was named after a favorite aunt, Marybelle (Minerd) Beggs Walls. On Dec. 27, 1905, at her parents' home, 19-year-old Marybelle married 33-year-old John Scott Riley (Oct. 21, 1872-1948). He was the son of Cyrus P. and Druscilla Catherine (Baer) Riley of Menden, Westmoreland County, PA. J.W. Perkins performed the ceremony. There was a 14-year age difference between the bride and groom. The Rileys went on to produce six children -- Ewing Halfred "Markle" (or "'Mike") Riley, Catherine "Casey" Driscoll, Virginia Rae "Ginsy" Snyder, Arminta Imogene "Minnie" Keough, Mary Louise "Lou" Lloyd and Joann "Jo" Long. Seen here are Marybelle and John circa 1912 with their eldest two children, Markle (right) and Mary Louise. They lived in "a large roomy frame house" at 23 South Third Street in Youngwood, Westmoreland County, PA, said to an article in the Greensburg (PA) Tribune-Review. Marybelle and John were members of the Youngwood Evangelical United Brethren Church, where he belonged to the Men's Bible Class. John was a longtime conductor for the Pennsylvania Railroad and a member of the Brotherhood of Railroad Trainmen. He is mentioned in the book, Way Back When: Youngwood, The Railroad Town. Mary Belle and her brothers and sisters annually organized a reunion at the old Minerd family homestead in Dunbar. It was always held on their father's birthday each July. Highway between Youngwood and Greensburg featuring an Amoco gasoline filling station and advertising for Sterling Gasoline. Seen here is a four-generation photo, from left to right: Marybelle, Mary Carol Driscoll, Catherine Driscoll and Rev. Minerd. 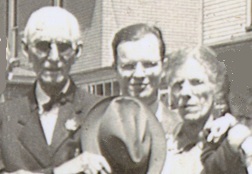 John and Marybelle are seen at right in an undated family photograph, holding granddaughter Judy Snyder Campbell circa 1942. Marybelle endured a cerebral hemorrhage in late July 1947. She lingered for two days and died on July 28, 1947, at the age of 60. Her remains were placed into eternal repose in Youngwood Cemetery. John only outlived her by less than six months. Suffering from a lesion on his heart valve for two and a half years, he was stricken with a heart attack and succumbed at the age of 75 on Jan. 20, 1948. He rests beside his wife at Youngwood Cemetery. The Riley children and grandchildren held a family reunion in 1980 at Youngwood Area Park and Pool. It was the last reunion where all the Riley children were living, as Virginia sadly passed away later that year. The reunion generated newspaper coverage in the "Love Lines" column by Ruth Love. The column said that "Back in an era before electric washers and driers, multiple clotheslines in the Riley backyard on Mondays attested to the painstaking needlework that produced the homemade blouses for the one son and the colorful percale and gingham dresses and pinafores that kept five daughters 'neat as a pin'." Son Ewing Halfred "Markle" (or "'Mike") Riley (1907-1982) was born on Jan. 21, 1907 in Youngwood. As a boy, his mind was filled with wonder when receiving postcards from his uncle Ewing David Minerd, serving in the U.S. Army in France during World War I.
Markle retired to Florida where he lived in the Cape Coral area. He made a donation in the early 1970s to support publication of a book celebrating the 75th anniversary of Youngwood's founding, entitled Our Town in Picture and Story: Youngwood, Pennsylvania, 1899-1974. Just 10 days after his 75th birthday, Markle passed away in Cape Coral on Jan. 31, 1982. A memorial services was held at Cypress Lake United Methodist Church, with Rev. Paul E. Vandine officiating. Burial was in Lee Memorial Park. Daughter Mary Louise "Lou" Riley ( ? - ? ) was born in (?). She graduated from Youngwood High School and studied at Boyd's Business College in Pittsburgh. As a young woman, she was employed at the Walworth Company in Greensburg where she met her future husband. On May 11, 1932, in Greensburg, Westmoreland County, she wed David James Lloyd Sr. (Oct. 28, 1908-2004), the son of David and Margaret (Vogel) Lloyd of Latrobe, Westmoreland County. In reporting on the wedding, the Connellsville Daily Courier said that "only immediate members of the two families were present at the ceremony. The bride was becomingly attired in an ensemble of cadet blue and carried a bouquet of ochre roses.' Lou's sister Catherine served as bridesmaid, and David's brother Arthur as bridegroom. They resided for many years in Huntingdon, PA and had eight children -- John Riley Lloyd, Margaret Hennessey, David J. Lloyd Jr., J. Alan Lloyd, Sara C. Lloyd, Rebecca A. Cole, Elizabeth J. "Liz" Hinchee and Eleanor J. Lloyd. From 1945 to 1947, David served with the Pennsylvania National Guard, Company D, in Indiantown Gap, PA.
Said the Huntingdon Daily News, he "was an assistant manager of Sears Roebuck in Altoona until he acquired Lloyd's Hardware in Huntingdon. He sold the hardware business and went into sales with C.H. Miller Hardware and later with D.W. Miller, which took him on the road statewide." He also was a grand knight of the Knights of columbus and a member of the Lions Club. In about 1952, they purchased a farm at Yellowsprings, PA.
After retirement, when David was age 72, he and Lou retired to North Fort Myers, FL. After Lou's passing, he spent his final years with his son David in Mesa, AZ. On May 25, 2004, at the age of 95, David passed away in Mesa. In an obituary, the Daily News said he was survived by 20 grandchildren and 30 great-grandchildren. His remains were returned to Huntingdon for interment in Holy Cross Cemetery, with Rev. Leo Arnone officiating at the funeral. Son John Riley Lloyd (1934-2008) was born in 1934. In 1955, he was a corporal in the U.S. Army, and appeared with his comrades on the Ed Sullivan Show as guest artists under the name of "The Rifle Airs." 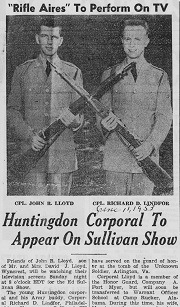 A story in the Daily News said they presented "their now-famous rifle demonstration and drill, with twirlings, twistings and tossings just about as fast as the eye can follow." John also served on the guard of honor at the Tomb of the Unknown Soldier at Arlington National Cemetery. John married Margie Belin and had three children -- Elizabeth Neff, Perry Anthony Lloyd and christine Marie Thompson. John wedded a second time to Jean Betchelor and had two more children, Jennifer Mentzer and Jason Lloyd. His third bride was Anne Englund. Later in life, John resided in Arcosanti, an artist community in Arizona. He passed away at the age of 74, in Lancaster, PA, on Feb. 6, 2008. Daughter Margaret Louise Lloyd (1939-living) was born on Jan. 12, 1939. She married Robert O'Donnell and produced four children -- John Shea O'Donnell, Jeffrey Scott O'Donnell, Joel Shawn O'Donnell and Julie Shannon O'Donnell. Her second husband was Charles Hennessey. She has made her home in Norristown, PA. Son David James Lloyd III (1944-living) was born on March 12, 1944. He married Susan Shively. They have made their home in Mesa, AZ. They are the parents of Philip Lloyd and Michael Lloyd. Son Joseph "Alan" Lloyd (1946-2005) was born on May 15, 1946. He never married and made his home in Naples, FL. Sadly, Alan died in Pompano Beach at the age of 59 on Nov. 26, 2005. Daughter Sara Catherine Lloyd (1948-living) was born on Feb. 3, 1948. She married John Licata and has one son, Eric Licata. She and her second husband, Jeffrey Jones, produced three more offspring, Jeffa Jones, Jarod Jones and Christa Jones. Sara has dwelled in Bradenton, FL. Daughter Rebecca Ann Lloyd (1949-living) was born on April 30, 1949. She was united in wedlock with Robert Eugene Cole. They have resided in Los Gatos, CA, and their two children are Bryson Cole and Brittany Cole. Daughter Elizabeth J. "Liz" Lloyd (1952-living) was born on March 14, 1952. She married her first husband, Michael Anthony Sims, and had three children -- Stacia Ellenberger Scalia, Angela Sims and Michael Anthony Sims Jr. Later, on New Year's Eve 1998, she married again to Dennis C. Hinchee. The Hinchees live in Tyrone, PA.
Eleanor Jane Lloyd (1952-living) was born on March 14, 1952. She lived in Arlington, VA for many years and now makes her home in Rehoboth, DE. Daughter Catherine Mae "Casey" Riley (1912-2001) was born on May 27, 1912 in Youngwood. At the age of 23, on Oct. 4, 1935, she eloped to marry Charles Robert Driscoll Sr. ( ? - ? ), son of James J. and Cora (Payne) Driscoll. The ceremony was held in Harrisonburg, VA at a Presbyterian church, with Rev. Parke W. Wilson officiating. Serving as her matron of honor was Mrs. Earl D. Eisenhower of Charleroi, PA. Said the Connellsville Daily Courier, "The bride was attired in a brown crepe dress with harmonizing accessories. Her corsage was of yellow tea roses.... The wedding, one of the most interesting of the early autumn, came as a surprise to the many friends of the bride and bridegroom... [She] is popular socially at Youngwood and is also well known among Connellsville's younger set having at one time been assistatn in the dental offices of her uncle, Mayor H.D. Minerd.... Mr. Driscoll, who is one of the most widely known young men of Connellsville, is classified manager for The Courier." On their honeymoon, the Driscolls accompanied by the Eisenhowers made a driving trip to Norfolk and Staunton, VA. The couple resided at 1001 Sycamore Street in Connellsville, Fayette County, PA. They had two children, Charles Robert Driscoll Jr. and Mary D. Naylor. Sadly, son Charles died at birth in Connellsville State Hospital on April 10, 1942 from a prolapsed umbilical cord. The infant's remains were placed into rest in Hill Grove Cemetery. Tragedy cut short the Driscolls' married lives. On the fateful day of Aug. 16, 1948, while swimming near Pier 5 of the Youghiogheny Dam, Charles mysteriously drowned. He was only 45 years of age. Interment was in Green Ridge Memorial Park. Now widowed, Catherine was employed for many years with Robertshaw Controls, New Stanton, from where she retired. She was a member of Christ United Methodist Church in Youngwood. Her final years were spent in Latrobe, Westmoreland County. In 1992, Catherine received a surprise party at the Knights Inn hotel in New Stanton in honor of her 80th birthday. The founder of this website was privileged to attend and meet more of the family. Catherine also attended at least one Minerd-Miner Reunion circa 1994, held at Kingwood, Somerset County, PA.
Catherine passed away at home at the age of 89 on Dec. 3, 2001. A memorial service was held at her family church, led by Rev. Dr. Merritt Edner. An obituary was printed in the Greensburg Tribune-Review. Daughter Mary Driscoll married William Naylor. They have three children and have resided for many years in New Stanton. Daughter Virginia Rae "Ginsy" Riley (1915-1980) was born on New Year's Day 1915 in Youngwood. She wedded Ralph V. Snyder (April 17, 1916-1999), son of Rev. Meade M. and Elizabeth (Wolfe) Snyder. The Snyders resided in Youngwood, and their two daughters were Jean Pacelli and Judy Snyder. Virginia was an early nursing school graduate, and a pioneering flight attendant for TWA Airlines. She is pictured below with her fellow trainees, circa 1939, and the rare image of her with national celebrity and airline passenger Jack Benny was our "Photo of the Month" for December 2000. Ralph worked at the Silvis Farm and Bergman Dairy over the years, and belong to the Elks of Lehigh Acres, FL. The Snyders made their home for decades on North Sixth Street in Youngwood. They were members of the Christ United Methodist Church of Youngwood. Virginia passed away at age 65 on Nov. 10, 1980, while a patient at Allegheny General Hospital in Pittsburgh. An obituary was published in the Greensburg Tribune-Review. Her remains were placed into rest with her parents. Later, her sister Minnie's remains also would be placed in the same family plot at Youngwood Cemetery. Ralph survived his wife by 19 years, remarried to Gwen (?) and made their home in Lehigh Acres, FL. He died in Florida at the age of 82 on Jan. 24, 1999. A memorial service was held in the family church in Youngwood. Left: Virginia Riley (far right) with fellow TWA flight attendants. 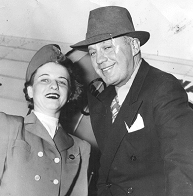 Right: with famed passenger Jack Benny. Daughter Jean A. Snyder married Michael A. Pacelli Jr. (Jan. 27, 1944-2017), son of Michael A. and Violet (Tucci) Pacelli Sr. Their only son is Michael Pacelli III. They resided in Youngwood, where Michael was employed by Stanley Communications in Greensburg, and which was their base for a deep involvement in community affairs. Jean has been an officer of the Youngwood Junior Woman's Club. Michael was a 16-year member of Youngwood Borough Council and served as president in 1991. He also was a member of the Youngwood Diamond Jubilee Committee and for 50 years volunteered with the Youngwood Fire Department, serving as chief for 14 years from 1971 to 1985. In addition, he was president of the Westmoreland County Borough Association and devoted time and effort to the Council on Government. He is pictured in Our Town in Picture and Story: Youngwood, Pennsylvania 1899-1974. Sadly, Michael died at age 73 in Excela Westmoreland Hospital on May 23, 2017. Father Bill McGuirk officiated at a funeral service at Holy Cross Church, with burial in Youngwood Cemetery. Daughter Judy Snyder wedded John J. "Jack" Campbell, son of John J. Campbell and Irene (Sargent) Campbell Jr., of the family of James M. Enos. The Campbells make their home in Youngwood and have three daughters, Janice Hawk, Jayne Campbell and Joy Campbell. Jack has served as Pennsylvania Commissioner for the Clan Campbell Society, North America and as Deputy Commissioner of the Clan's Region 2, covering Pennsylvania, New York and New Jersey. In 1992, Jack met the founder of this website and introduced him to a number of his Enos family relatives with Minerd connections. Daughter Arminta Imogene "Minnie" Riley (1917-1986) was born on May 15, 1917 in Youngwood. She was joined in matrimony with Regis William Keough (1915- ? ). The family made its longtime home in Youngwood and there were four children -- William John Keough, Regis Paul Keough, Patricia H. Davis Burklycica and Edward Keough. The Keoughs were members of Holy Cross Roman Catholic Church in Youngwood. In later years, they moved to Fort Myers, FL. Minnie passed away in Fort Myers at the age of 69 on Oct. 31, 1986. An obituary noted that her survivors included six grandchildren. Her remains were placed into eternal rest with her parents and sister Virginia Snyder in Youngwood. Son William John "Will" Keough relocated to California. He resided in Santa Cruz, CA in 1986. He has one daughter, Jocelyn Keough. Son Regis Paul Keough (1951-2018) was born on Aug. 3, 1951. On June 12, 1982, at the age of 31, he married Cynthia Seiler (June 11, 1952-2003). They were the parents of twin sons Timothy Daniel Keough and Christopher S. Keough, and daughter Alison Denise Ofcansky. The Keoughs made their home in Youngwood, and Regis was employed with Robertshaw Controls. They were members of Christ United Methodist Church, also of Youngwood. Regis especially enjoyed music. Sadly, Cynthia succumbed to an illness on March 11, 2003. Regis survived his bride by more than 15 years. He passed into eternity at the age of 67 on Oct. 14, 2018. Grandson Timothy Daniel Keough married Andrea and lives in Charleston, SC. Grandson Christopher S. Keough wedded Alyson. Their home is in Greensburg, Westmoreland County. Granddaughter Alison Denise Keough was joined in wedlock with John Ofcansky. They reside in Youngwood. Daughter Patricia H. Keough (1954-2018) was born on Sept. 8, 1954 in Greensburg. She was wedded twice. Her first spouse was William Ralph Davis ( ? - ? ). They produced two children, Gregory Patrick Davis and Melissa Ann Davis. Her home in 1986 was in Youngwood. In about 1988, she married a second time to Joseph Burklycica ( ? -living), and their union lasted for three decades until the separation of death. They made a home in Mount Pleasant, Westmoreland County, and Patricia was employed by Robertshaw Controls in Youngwood. Stricken with cancer, Patricia died at the age of 63 on June 18, 2018. An obituary was published in the Greensburg Tribune-Review. Grandson Gregory Patrick Davis was united in matrimony with Irene. They dwell in San Diego. Granddaughter Melissa Ann Davis lives in Youngwood. Son Edward Ewing Keough married Ellen Colgan. They lived in Oswego, NY in 1986, and their children are Kathleen Louise Keough and John Colgan Keough. Daughter Joann Druscilla "Jo" Riley was born on July 4, 1926 in Youngwood. On Nov. 11, 1949, when she was 23 years of age, Joann was united in wedlock with J. Hubert Francis "Nubie" Long ( ? -living), also a resident of Youngwood. Their marriage lasted for 68 years until the separation of death. Their eight offspring were Druscilla A.. Burke, Francis John Long, George Scott Long, Christopher James Long, Richard Andrew Long, Letitia Anne Long, Patrick Anthony Long and Suzanne Marie Long. The Longs initially dwelled in Youngwood until moving to Arlington, VA followed by a relocation to Mitchellville, MD in 1955. Said the Lewes (DE) Cape Gazette, "Joann was employed by the Armed Forces Security Agency, the precursor to the National Security Agency, until 1956. In 1956, they moved to Glen Burnie, Md., where she was a full time mother and homemaker. She later worked at Anne Arundel Community College." Upon their retirement in 1982, the Longs moved to warmer climate in Vero Beach, FL, where they spent their winters, while maintaining a summer home in Rehoboth Beach. Then in the mid-1990s, they returned for good to Rehoboth. Joann met the founder of this website at her sister's Catherine Driscoll's 80th birthday party in May 1992. Joann passed away at Country Meadows Assisted Living in York, PA on Dec. 1, 2017. An obituary in the Cape Gazette noted that she was survived by 11 grandchildren and a dozen great-grandchildren. Daughter Druscilla Ann Long married John Thomas Burke II on July 12, 1975. Their two children are Joseph Thomas Burke III and Jessica Anne Burke. Son Francis John Long married his first wife, Virginia Alexis Velis. Their only son was Thomas Jackson Long. John was wedded a second time to Leslie J. Spears, and the couple produced two children, Jacqueline L. Long and John Benjamin Long. Son George Scott Long was wedded to Mary Alice Cronin on Feb. 3, 1974. Their three children are Karen Elizabeth Cronin, Brandon Scott Cronin and Weslee Ann Cronin. They make their home in York, PA. Son Christopher James Long was joined in matrimony with Mary Ellen Dailey on Dec. 17, 1977. They have one daughter, Katherine Marie Long. Their home is in Frankford, DE. Son Richard Andrew Long makes his residence in Rehoboth Beach. 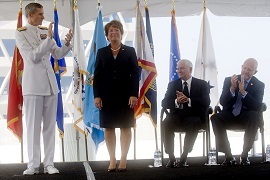 Letitia Long receiving congratulations upon becoming the first woman to head a U.S. intelligence agency, and making remarks at the 2010 ceremony. Daughter Letitia A. Long served as Deputy Under Secretary of Defense for Intelligence in 2003-2006 and Deputy Director of Naval Intelligence in 2000-2003, then becoming Deputy Director of the Defense Intelligence Agency (DIA) from 2006 until 2010. She became the first woman to head a United States intelligence agency in 2010 when she was tapped to become director of the National Geospatial-Intelligence Agency. NGA creates geospatial intelligence (GEOINT) using remotely sensed data, physical geography, land cover and cultural data collected by a myriad of sources to help its mission partners visualize and understand the world. NGA provides data and analytical services to support safety of navigation on land, air and sea. A photograph of Letitia receiving congratulations from outgoing director of the National Geospatial-Intelligence Agency Vice Admiral Robert B. Murrett, Secretary of Defense Robert M. Gates and Under Secretary of Defense for Intelligence James R. Clapper, Jr. was our Photo of the Month in June 2012. Son Patrick Anthony Long is deceased. Daughte Suzanne Marie Long dwells in Baltimore, MD.